As Georgia’s second-largest city, Columbus lies 100 miles southwest of Atlanta in Muscogee County. 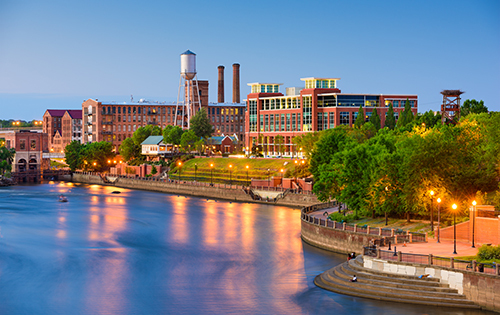 To the west is the Chattahoochee River, which divides Columbus from Phenix City, Alabama. Columbus experiences all four seasons, and the average temperature range is between the 30’s during colder months, and the 90’s in the summer. The city area is within USDA hardiness zone 8a and 8b, and the Muskogee Crape Myrtle is the official tree of Columbus. There are several parks, trails and outdoor activities that make this city a pleasure. However, as with all US cities, weather, disease and property development make land clearing and the removal of trees a necessity. Following is an excerpt about the tree removal and protection ordinance for Columbus Ga, and can assist you in the removal of dead or hazardous trees. Do I Need a Permit for a Removal in the City of Columbus? The tree removal process in the City of Columbus is extremely straightforward. The City does not regulate the removal or upkeep of trees on private property and there is no permit requirement. After an emergency or when a property owner makes the decision to have a tree removed, it is highly recommended that a professional tree removal service is hired and they are licensed and insured. It is the responsibility of the tree removal service to remove all debris from the property. If the City of Columbus is called for debris removal, there will be a charge for this service. Trees on public or city property are the responsibility of the City of Columbus’ Urban Forestry Division, and their contact information is below. The City of Columbus Urban Forestry & Beautification Division is the city’s Arborist and regulating body for all matters dealing with trees.